The perfect place to keep all your amazing honeymoon memories of your first holiday as Mr & Mrs, Mr & Mr or Mrs & Mrs. This personalised honeymoon photo album scrapbook is the perfect gift for a newly married couple returning from their trip of a lifetime honeymoon. 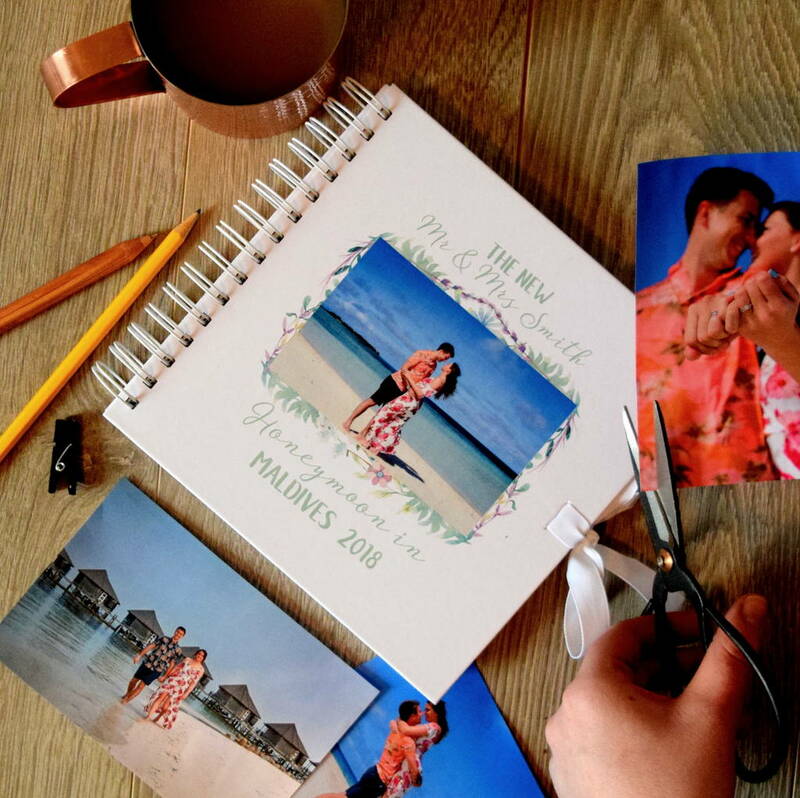 The personalised scrap book is printed with the photo of your choice, the couple's name and the destination of your choice, making this a great keepsake gift that the newlywed's can fill with all their photos and memorabilia of their honeymoon. The honeymoon memory book has plain white pages, so is perfect for sticking in holiday photos as well as plane tickets, trip tickets, souvenirs and trinkets that will remind them of the amazing time they had! 1. Go to "My Orders"
3. Attach an image to this enquiry and click send - This can be done straight from your phone or from a computer. . Please be aware that any delay in uploading your image will mean a delay to your expected delivery date. Can be personalised with the name's of your choice and the destination and year of your choice. Hard back, spiral bound book wtih 40 plain white thick paper pages.